I am a mechanic. I have a girlfriend of 7 years, and we love to travel and love to fish. We love anything about the ocean and every animal in it. I have been fishing since I was 5 years old. 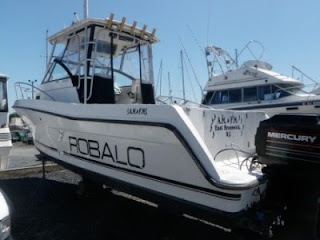 I got this 1995 Robalo 24 foot walkaround for a great deal. It was a one owner boat, and even came with the owner's manual! Right now it is called AM and FM, for the previous owner and his wife's initials, so I have to rename it. It was really dirty because it sat around for a year, so I have been cleaning it every day. I am finally ready to go out on it, but I need a name! My girlfriend has been trying for weeks to think of one and nothing seems right. Please help! I think "OCEAN'S AHOY" OR "GOOD FOR THE "SOLE"